I didn’t grow up drinking hard alcohol. To be clear, I also didn’t grow up (from childhood) drinking. I’d probably be surlier and have more scars. When I started drinking, it was generally beer that went down my gullet, probably due to the Dutch blood pumping through my veins. It wasn’t until I met my wife’s parents for the first time that I really acquired a taste for something more refined. Sure I’d downed some watered-down vodka tonics and dabbled with gin in college. I even insulted an old, Danish family-friend by suggesting his 30-year old Scotch tasted like rum (I was all of seventeen at the time). In essence, my alcoholic reference shelf was stocked with beer until my mid-twenties. Thus began the fine tradition of drinking quality spirits with my father-in-law. It started with dirty martinis and evolved into a love of whiskey. From strong Manhattans to double pours of twenty-year old booze, I found myself drifting away from beer to a world of caramel-colored refinement. After our holiday visitors left town and things settled down to their normal flow, the bar book started calling out to us in the evenings as the sun went down (sooner, some days). So taking quick stock of the bottles in our cupboards, we narrowed down our options to what was available. The decision landed on a classic: Whiskey Sours. I’d had a carelessly-poured whiskey sour with store-bought sour mix before, but I decided to take this back to basics. Brew some homemade simple syrup, squeeze some fresh lemons, and head off to the races. Throw (well…pour) your sugar and water into a pot on the stove. Bring to a boil and stir until the sugar is absorbed. Remove from heat and let the concoction cool. You’ll have a long-lasting batch of this syrup in a handful of minutes, and it beats the store bought stuff every time. Once cool, transfer your syrup into an airtight container and refrigerate. It should keep for about a month when stored in this way. Get yourself a cocktail shaker, fill it about half full with ice, then add your whiskey and simple syrup. 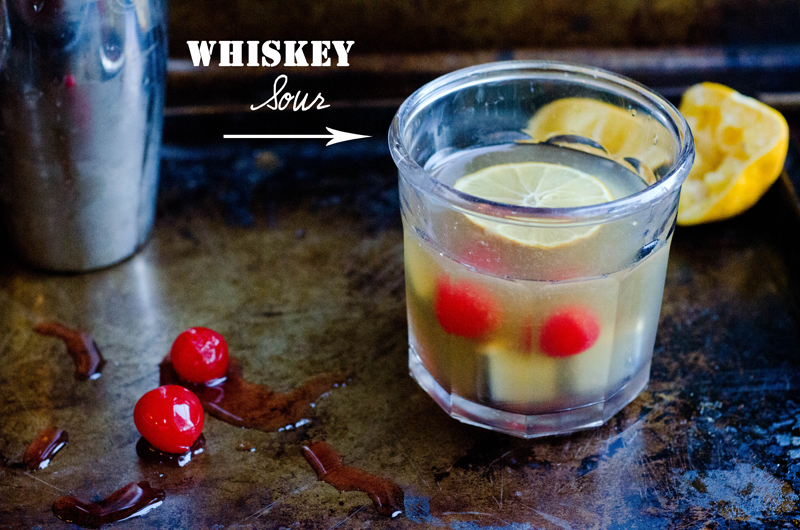 For a sweeter sour, add a little more simple syrup (the “official” recipe uses a half shot). Squeeze the half-lemon into the shaker. Top your shaker and [insert Andre 3000 reference] until everything’s fully mixed. Add a few ice cubes to a highball glass and pour your mixture over the top. 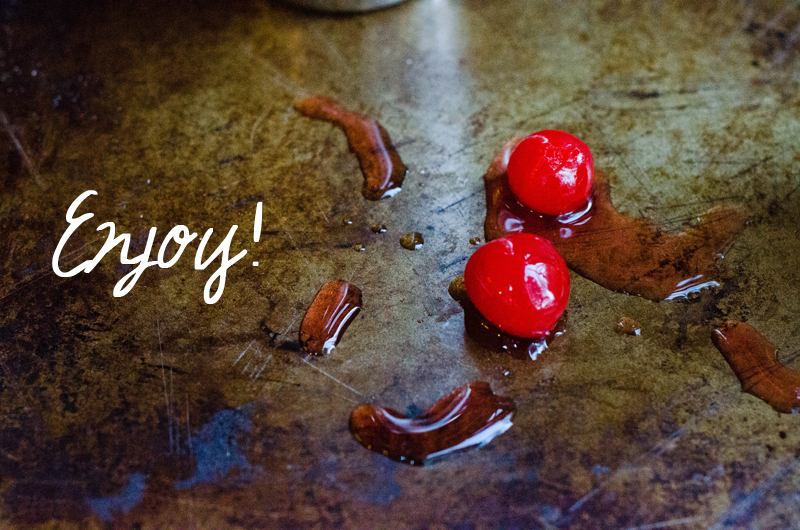 Add a maraschino cherry (if you like them) and enjoy! A well-crafted cocktail is sure to break the ice on even your most awkward interactions and might even forge lifelong relationships. Good luck out there (and drink responsibly, please). So cute! Thanks Peter! If I ever get to liking whisky, I’ll give this one a try! You left out the bitters! You barbarian! It needs a couple of dashes.